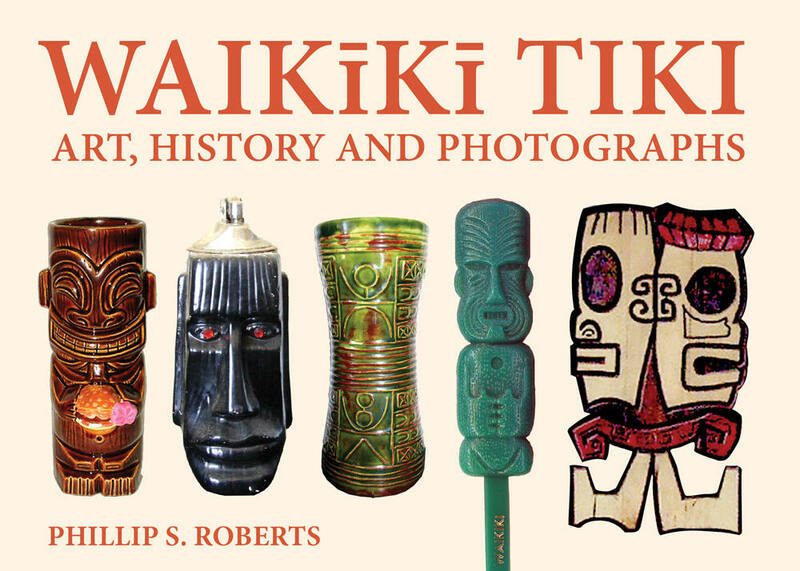 This is official website of the book "Waikiki Tiki: Art, History and Photographs" and it's author, (me) Phillip Roberts. 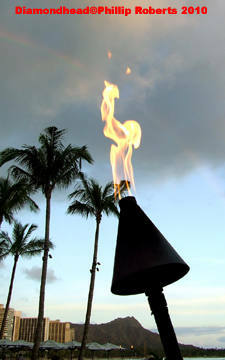 "WAIKIKI TIKI: ART, HISTORY AND PHOTOGRAPHS" REVIEWS! "Don't let the compact size fool you. This hugely enjoyable ride through our mutated cultural landscape, as defined by carved wooden tiki statues, probably has more cool dope per page than any other Hawaii book we can think of. Tikis are the icons, the graven images of tiki culture, born of that sunset lounge experience of exotic music, flaming torches, grass walls, bizarre, fruity rum-based drinks and black velvet paintings of nubile maidens glowing in the dark. Watching over it all are the statues hewn from wood, eyes bulging, mouths grimacing — the kitschy kids of Hawaii's sacred ki'i by way of Easter Island and Hollywood. Ki'i are sacred; tiki are commercial props, and Phillips' mania for recording the cultural grab bag of tiki production seems to know no bounds, ranging from enormous wooden pillars for architectural purposes to tiny reproductions. Henry Kapono, in a charming introduction, reveals that one of his first toys was a tiki key-chain dangler with glass eyes. This is one of those instant nostalgia books that maniacally delves into a previously overlooked corner of pop mythology. It covers the era when Waikiki evolved from a beach with some hotels to a gloriously overcooked homage to romanticized South Pacific fantasies. And it's already fading as Waikiki becomes more international and generic. We like this book a lot." — Burl Burlingame, "Honolulu Star-Advertiser." "The effigies of the Hawaiian ancestors and their neighboring brothers have been studied, discussed and displayed in museums as valued cultural heirlooms for over a century. In the meantime, their populist likenesses were marginalized as tourist art, neglected and forgotten. It is time that 20th Century Tiki gets recognized as unique art form that had its own time, place and meaning for a different, new generation of islanders and visitors from all cultures. Waikiki Tiki makes an essential contribution to the appreciation of this Polynesian pop culture." — Sven Kirsten, Author of "The Book of Tiki" and "Tiki Modern"
"Whether you’re obsessed with tiki culture, find it tacky, or see it as an offensive display of cultural appropriation, you can’t deny the love that Phillip S. Roberts put into making this book. It’s a catalogue of Hawaii’s recent past, a piece of our modern popular culture we can’t deny, nor according to the author, one we shouldn’t be afraid to embrace." — Alex Alba, "Hawaii Book Blog"
"Waikiki Tiki is a fascinating and richly illustrated portrait of how the new incarnation of tiki--forever changed by its appropriation into mainland pop culture--has triumphantly returned to its homeland to inspire, entertain, and educate generations of kama'aina and haole alike." — James Teitelbaum, Author of "Tiki Road Trip", and "Big Stone Head: Easter Island and Pop Culture"
"One would think that finding Tikis in the tourist capital Waikiki would be like shooting fish in a barrel. This is not the case. It takes the kind of passion and perseverance that Phillip Roberts has to unearth the evidence of Tiki's rise, fall, and rise again in Hawaii. On first visit to Waikiki with my wife on our honeymoon, we'd just been married in an old mainland Tiki bar, we thought we'd find Tikis at every turn. During our visit, and on subsequent trips, we only managed to find traces of Tiki's heyday. But with Phillip's thorough research, this book gives a fuller, clearer picture of Tiki's history and newfound popularity on the island." — Duke Carter, Author of "Tiki Quest: Collecting the Exotic Past." Waikki Tiki: Art, History and Photographs.